This book prompts readers to make their own meaning by considering a series of questions. Abundant examples and case studies from the frontlines of school change provide inspiration and ideas you can adopt or adapt for your context. Discussion prompts are included to promote and provoke conversations-both inside and outside school-with everyone who has a stake in student success (including students themselves). Working together, through collaborative inquiry and hard conversations, you will arrive at your best answers for how schools should adapt for your context and your children. 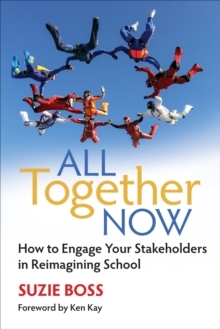 This four-part framework, based on insights from those at the leading edge of change, will help readers navigate the journey ahead: (1) The Why: To help a community reimagine school, effective leaders must first build common understanding about why change is necessary. (2) The How: Moving from vision to reality requires practical considerations. For example, stakeholders with diverse backgrounds bring a wealth of experiences and perspectives to shape the future of education. To collaborate effectively, however, they need to speak the same language. (3) The What-ifs: Only on paper do plans unfold without any push-back or detours. Leaders who maintain momentum and overcome resistance to "what ifs" and "yeah buts" share their troubleshooting strategies in this section, preparing readers to anticipate challenges and be more effective change managers. (4) The Future Story: School leaders who are taking courageous steps to reinvent education understand the power of story. A superintendent who regularly tweets out examples of powerful student learning or a principal who blogs about school-business partnerships helps to build public understanding of 21st century learning. Keeping change efforts from backsliding requires ongoing communication, effective storytelling, and optimism about the future. This book will walk readers through these four critical stages, helping communities mobilize around the shifts that students deserve. Compelling examples from schools on the leading edge of change will inspire readers to embark on the challenging work ahead. The book is intended to be a practical action guide, taking readers from talking about the future of learning to realizing their community's vision.